Try to avoid or minimise the use of chemicals in your garden. A wildlife friendly garden will develop its own natural control for pests and diseases. 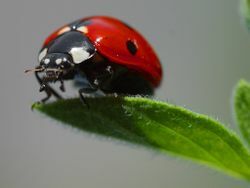 Seven-spot ladybirds are widespread and common in Britain and are beneficial to organic gardeners because they are insectivores, consuming aphids, fruit flies, thrips and other tiny plant-sucking insects that damage crops. In fact, their name is derived from "Beetle of Our Lady," recognising their role in saving crops from destruction. A ladybird can see in different directions all at once. Their eyes are called Compound Eyes. They have eyes shaped like a hexagon with a lens in each one which acts like a separate eye to them. Ladybirds are brightly coloured to ward away potential predators. This defence works because most predators associate bright colours (especially orange and black) with poison and other unpleasant properties. This phenomenon is called aposematism. Most ladybirds are toxic to smaller predators such as small birds. Adult ladybirds are able to reflex-bleed from their leg joints, releasing their oily yellow toxin with a strong repellent smell. A new ladybird has arrived in Britain. The Harlequin Ladybird (Harmonia axyridis) an unwelcome invader! This ladybird is an Asian species which was introduced into America 25 years ago to fight aphids. However, this ladybird also poses a deadly threat to butterflies, lacewings and many other beneficial ladybirds since it eats the eggs and larvae of these beneficial garden insects.